Energieavantgarde Anhalt (EAA) e. V. is an alliance of committed citizens, communities, companies and institutions, as well as regional and national partners, working on sustainable development and localised energy turnover in the region around Anhalt-Bitterfeld-Wittenberg. For decades the region has been an important hub, demonstrating the transformation from one of the most polluted areas in Germany to one of the most environmentally conscious. Joining efforts for sustainability – Founded in 2015, the Energieavantgarde Anhalt e. V. is a network of active citizens, institutions and business representatives in the region. The Energieavantgarde Anhalt e. V. cooperates closely with national and European partners on the sustainable transformation of the local energy system. It is no coincidence that the avantgarde movement originated in the region of Anhalt. Historically, this place has been an important hub of cultural, social and technical transformation. From environmental disaster to sustainable innovation – The history of the region Anhalt-Bitterfeld-Wittenberg, with its upheavals and transformations, demonstrates the ambivalence of the industrial developments of the 20th century. Whilst these of course brought innovation and economic development, they also caused extreme environmental pollution, producing the highest CO2 emissions in the country. The far-reaching industrialisation that lasted until the end of the last century left its mark on the entire region; open mines, empty power plants and large scale industrials wastelands. Fortunately, with the emergence of the modern, ecologically responsible chemical, engineering and other industries and the expansion of renewable energy industries, the reversal of the environmental decline is well underway. 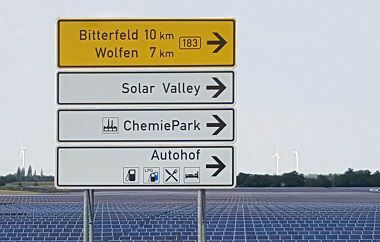 Above all, the Solar Valley in Thalheim and other solar projects have become one of the successful initiatives, followed by the expansion of production facilities for wind and bioenergy technologies, which also recently emerged. Striving for localised energy turnaround – The “re-productive city” research project is emblematic of what Energieavantgarde Anhalt e. V is aiming to achieve. Since the summer of 2016, representatives of the city government of Bitterfeld-Wolfen have been working together with residents, local companies and relevant institutions on a strategy for localising energy turnaround and improving sustainability efforts. Conceptualised as a Living Lab, the recently launched experimental project is striving to become a model for other cities, demonstrating how the re-production capabilities of medium-sized, polycentric communities can be strengthened by providing second usage for untapped resources such as green waste, the sun, wind, fallow land and secondary materials. In this project, the Fraunhofer Institute for Microstructure of Materials and Systems IMWS supports the Energieavantgarde Anhalt e. V. and the regional development of Anhalt-Bitterfeld-Wittenberg. Furthermore, the area serves as a magnet for renowned academics from different disciplines, including Prof Sabine Hofmeister, who holds a Professorship in Environmental Planning at the Leuphana Universität Lüneburg, Prof Jörg Bagdahn, President of Anhalt University of Applied Sciences focusing on Materials of Photovoltaics, Berit Müller who is leading a research group of the "Transformation of Energy Systems" at the Reiner Lemoine Institute. All of these factors combine to make the area an exciting and unique open-air experimental platform for environmentally-focused research.